WSO2 API Manager provides multiple ways in measuring the performance of its server runtime. The server performance can be measured by the management console of the API Manager. Alternative to this the server runtime performance can also be monitored remotely through a JMX client such as JConsole. Given below are the steps required to configure the performance monitoring of the API Manager via JMX. On the API Manager Server startup you would find the JMX server URL as below. This URL allows the JMX endpoint of the WSO2 API Manager to be accessed remotely. 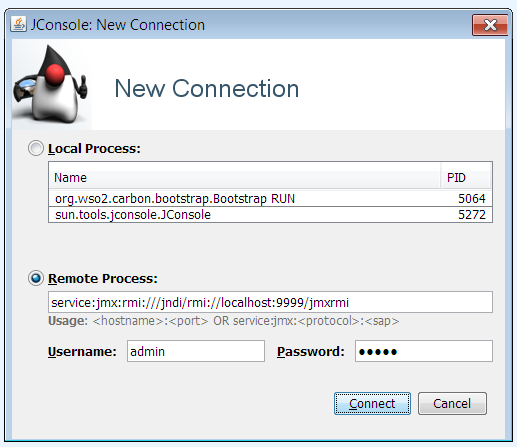 Start JConsole, JConsole can be found in JDK_HOME/bin folder. JConsole can be started by typing jconsole in the Shell/Command prompt. In the JConsole ‘New Connection’ page enter the above JMX service URL of the API Manager along with the admin username and the password as shown below. Once this is done click on the connect button. Now you would be able to see statistics relating to the WSO2 API Manager Server runtime in the JConsole.